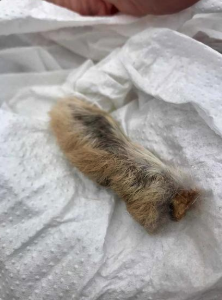 Several dozen West Hollywood residents got their fur ruffled when a local man posted a photo of what appeared to be a severed dog paw that he found on Havenhurst Drive yesterday. But before getting your fur ruffled, dear reader, read on …. The paw “appears to have been chopped off by someone with an extremely sharp instrument, Stefen Liberti said in his post on NextDoor.com, a neighborhood website. Liberti said he found the paw on the ground in the 1000 block of Havenhurst south of Santa Monica while he was walking his own dog. The paw found on Havenhurst Drive. His post on NextDoor drew several dozen comments from residents, with some guessing it was a coyote’s paw and others asking if Liberti had notified the police. The post also prompted complaints from several residents about what they have seen as a surge of crime in the area, a claim that isn’t substantiated by reports from the West Hollywood Sheriff’s Station. “This is atrocious! I blame this squarely on the politicians (and those who vote them in) who not just turn a blind eye to the criminals but welcome them in instead of protecting the tax paying, law-abiding citizens who live here,” wrote one neighbor. Late this morning, after Laurel Pet Hospital had examined the paw, Liberti followed up with another post on NextDoor that likely will let dog lovers breathe a sigh of relief. However, rabbit lovers now have more reason to hold their bunnies tight. As a kid, on road trips, we’d stop at Stuckey’s, they were a chain of coffee shop/gift shops along the highways..and I remember buying a “lucky rabbit” key chain. Would I do the same now? No…but it was a different era…. Hey Hank , we the residents can attest to the increase in crime. I became a statistic last Sunday , we’ve had 2 robberies and 1 mugging on our street in the last 7-14 days… so DONT be so quick to accept the sheriffs lack of reporting over the citizens real life experiences. I don’t know about that. Crime is up in our community. With the increase in homelessness and the impacts of Prop 47, there is a lot of criminal activity out there these days. Mail theft, package theft, burglaries, arson, armed robberies, shootings, etc. are occurring on a daily basis and there is not much the police and sheriffs have been able to do about it. Prop 47 has been a disaster but nobody wants to talk about if for some reason. Meanwhile, we suffer. A good reason why California needs to get off this Measures and Propositions culture. No other state expects an uninformed or misinformed public to make these important decisions. The decision makers that we elected should stop deflecting responsibly and do their job. “NextDoor” is only good for spreading knee-jerk histrionics like this…..No Bueno.